It’s been a hot minute. I miss this thing. I miss babbling about nothing. I miss all of you wonderful people who actually read said babbles! I’m not going to sit here and go on and on about why I haven’t been writing. The excuses have not changed. The reason I haven’t been writing Birchbox or Ipsy posts is because I rarely have time to use all the samples. And it wouldn’t be an accurate review post if I didn’t review all of them, right? Sometimes I don’t have time to let a hair mask sit on my head for precisely 7-10 minutes. Or to let my nails dry or even to find a time in my schedule to stop biting my nails long enough to make them worthy of painting. Or to apply wrinkle cream and sit and stare at myself in the mirror to see if my fine lines are disappearing before my very eyes. Ain’t nobody got time for that, y’all. This box was my dream come true. This box was for the working bride on the go. I was able to use all of these products, one right after the other. Me likey. I’ve mentioned before how much I love this brand. I often use their Alchemic Silver Conditioner to brighten up my blonde when it becomes brassy. Fair warning… do not, I repeat, DO NOT purchase this conditioner off of Amazon. I got a shampoo and conditioner that I swear is counterfeit. The shampoo doesn’t lather and the conditioner doesn’t even smell like roses. It was a bummer, but I still use it, because, purple conditioner. ANYWAY, I was excited to get this shampoo. Partially because I knew it would not be counterfeit like its imposter friend who lives in the part of my shower where I stash the stuff I never use but manage to hoard anyway. This is not the first time I’ve received a Davines shampoo that’s also maybe sorta a body wash. Let’s get one thing straight. I’m not about to spend $30 on body wash. That’s what coupons at Bath & Body Works are for. I liked this shampoo a lot. It felt light and clean and smelled nice. My love affair with Davines continues. So guys, this one was a real mind boggler. If already getting something that was a combo shampoo/body wash was confusing enough, let’s try something that’s not just for your hair… but it’s also for your skin! And oh, it’s for your face, too! What. I literally took it out of the box and gave it a puppy head tilt. It was a small foil packet so I had to choose the body part I thought deserved to try it the most. It was definitely not enough to go ’round. I put it in my hair (after using the shampoo above) and immediately rinsed it out. This was not going to do anything for my hair. Plus it legit felt like lotion. I think I tried on a little bit after my shower to see if I liked it as a lotion, but I can’t remember what I thought so I have no opinion on whether or not this was effective as a lotion, either. Full Disclosure: this stuff did not touch my face. Yay! A face wash! I’ve become pretty addicted partial to my beloved philosophy Purity Made Simple face wash. It takes off all the makeup. I mean, all of it. It makes my BeautyBlender look like new every time. It cleans all my brushes. I’m pretty sure it could take an oil stain out of a driveway yet still be gentle enough to cleanse an angel’s wings at the end of the day. philosophy, you the real MVP. But alas, I decided to give something new a try. I have a lifetime supply of my regular stuff, anyway. 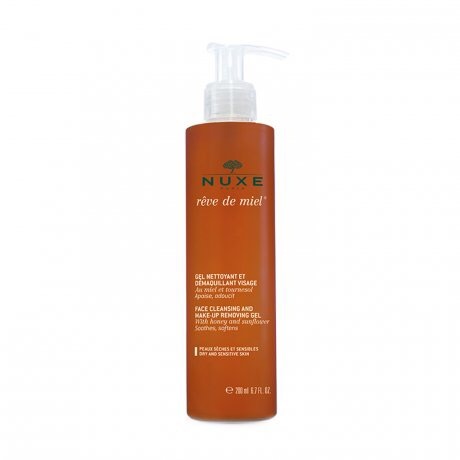 The NUXE face wash took off my tar-like Estee Lauder Double Wear Stay-in-Place Makeup Foundation. Can I say something about this foundation real quick? I used to consider Estee Lauder makeup to be “old lady” makeup. It turns out that these old ladies know what they’re doing, ok? This foundation is incredible. It hasn’t been around for 20 years for no reason. I tried to switch it up by trying a couple other foundations from Sephora, but I ended up returning them to switch back to this trusty old gal. Back to the face wash. I decided to wear an eyeshadow stick that day (reviewed below) and wanted to see how effective this face wash was in taking it off. It was not. In all fairness, I’m not able to wash my eyes very aggressively because of my lash extensions, but you shouldn’t have to aggressively wash your eyes, anyway. My philosophy face wash still has my heart. Now, this product name is speaking my language. Bonus: this is also Birchbox’s own brand. The price is not so bad, either! I believe they have sent me one of these before. It was a pretty vibrant gold, so it was definitely not an everyday color. Neither is this one. It is a darker brown and is probably a little too sultry for work. But I did wear it out and I loved it. It’s easy to put on and it stays put. It’s also easy to blend with your finger, which is hard to do with some of these shadow sticks. Shadow stick makeup is a little harder for me to take off with these falsies on (as I mentioned before) so I use them sparingly. My friend/coworker received one of these in her Birchbox a few months ago and she loves it. I was excited to get one of my own. This color was very pretty and neutral. The formula felt great on my lips, too! I will say, I was fully expecting for this to smell/taste like a PBJ. I was disappointed that it did not. Guess it’s back to the Lip Smackers for some tasty lip treats, y’all. I got an Ipsy this month too, but I’m not sure I’ll get to review it before July approaches. Because it is a hair mask. And nail polish. These things take time.